In a recently surfaced clip reportedly recorded during the making of his 2011 concert documentary, Never Say Never, a youngJustin Bieber, said to be 15 at the time, tells a racist joke and repeats the N-word several times. According to British site The Sun, Justin’s camp knew about the existence of the footage and was willing to pay to keep it from surfacing. TMZ claims it had the clip years ago but declined to post it because of Justin’s age and his team (not included in the clip). A source says that Justin is currently “frustrated and sad” and plans to apologize and address the clip publicly within the next day or so. 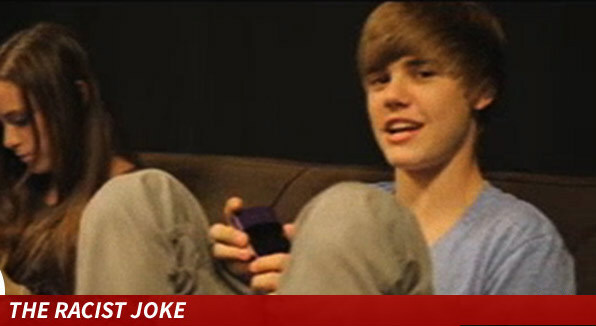 Justin Bieber Apologizes for Racist Joke. VIDEO BELOW: A 15-year-old Justin Bieber told a racist joke to friends … knowing his own photographer was in the room and rolling. Justin’s ex-bodyguard says the 5-year old video of Justin telling a joke using the n-word multiple times does NOT make him a racist … just a bad joke-teller. We all make jokes about people’s size, look, or race. That doesn’t mean it’s right but comedians make millions of dollars profiting off… of these jokes. If someone is racist or prejudice you would know from a persons actions. Not because of a joke a 15 year old says. What I do know whole heartedly is @justinbieber is not prejudice nor is he racist. He wasn’t raised that way and his family isn’t either. Yes he said some bad jokes and I know if he could he would take back what was said. He’s grown a lot in 5 years and as we all grow we learn. He will always be criticized and judged every day of his life by people who only know him because of blogs or the press. That won’t change. As a black man I am telling the world that @justinbieber is not a racist. I have known him since he was 12 years old and I know his heart. – LOL, what?!?! Since when had TMZ ever cared about Justin, or any celebrity for that matter? No, they knew that the story would get way more attention if they waited until he was über-famous and was just coming down from another big scandal. He was doing well, with his trip to Cannes and his huge donations to charity, so it was the perfect time to smear all of that by releasing something he naïvely said four bloody years ago. Es enserio? Justin racista?, es más que obio que no lo es, tiene a Kenny que es uno de sus buenos amigos y un hombre de raza negra y útimamente a Justin se le ve con muchos personajes de esa raza, si en caso el lo fuera ¿no creen que no andaría con ellos? tienen a buenos amigos como lil za, etc, Justin no es racista y dejen de crear rumores y chismes de el, tal vez dijo esa broma como muchas personas, tal vez si otra persona lo dice no lo toman en cuenta pero si es Justin y alo toman todo a mal como las drogas, etc y ahora quieren crear rumores de que es racista, NO! así no es, además es un poco de humor de un adolescente de 15 años. english plzzzzzz english………. I actually dont think justin is a racist but………. Idk…………. Really!?!? Okay. Paula Deen can say a comment (and it wasn’t filmed or on audio) and come out and admit publicly to it and she lost a TV show, endorsements, and a shitload of money ….. while this idiot will probably get away with having the N word on video and nobody will care. The idiot is in the public eye. What a dumb little idiot. Justin is a good guy. He loves all people. It was clearly a careless & bad joke and I’m sure Bieber didn’t mean any harm stating that joke. Seeing that he associates himself with a lot of black people out of his own good will.The only thing Bieber and the rest of the world has to remember about the mistakes you commit in life is that..
Bieber if ever in a million chance you are reading this, don’t let the past haunt you rather let the past teach you become a better man (not a boy- a man, a responsible adult). And continue on making your beliebers happy, simply by seeing you happy. I know you’re a good man, there are just some people who choose not to see that. God gave you a gift- your life. Do what makes you happy, apologize to those you have hurt & stop trying to please everyone. I despise TMZ!! They only pulled this out to continue trashing Justin Bieber in the media.. Everybody who takes the time to really get to know about Justin knows that he is certainly not a racist. Justin Bieber is the victim of backwards racism all the time for having black friends and for being influenced by urban culture and these same people who said he was trying to be black and doesn’t know what color his skin is have the nerve to attack him for something he said when he was only 15 years old! I seriously don’t know if that many people will even take this seriously that he is accused of being racist, for one simple reason he is constantly attacked for trying to be black all the time and for being surrounded by black people.. So he said something stupid when he was 15, the point is he has now apologized for it and said he isn’t that same naive kid he once was. I never thought for a second that he was racist. Who is the lady’s voice? She encouraged another joke? Is that maybe Catlin’s mom? Of course he’s not racist … yall know that he is seen around with black people all the time! CAN’T PEOPLE SEE THAT!!! THIS IS B*LL$#!+ !! A JOKE IS A JOKE! YOU HAVE TO UNDERSTAND THAT!! Black people should be banned from America. They can just go back to Africa or Philippines. They ruin the world. This joke was careless and immature. But that doesn’t say that Bieber’s racist. You can clearly see that Bieber hang outs mostly with black people. His ‘clique’ is mainly composed of black people. This was a bad joke and people may interpret it the wrong way but most of Bieber’s friends are black, so where’s racism in that? He chooses to hang out with black people and doesn’t at all complain. Some beliebers even claim that the black people Bieber chooses to surround himself with and be friends with are bad influence towards him. For what you said.. I no longer a fan of yours and you have lost as many fans here in Africa as you have ever made in yo life time. It’s a black man that pulled you from being un infamous kid you where and exposed you to the world. No white dude did that. It was the passion, the love of a black man that made you. Oh my goodness get over it. Don’t you think a lot of Comedians make racists. Or Celebs to. 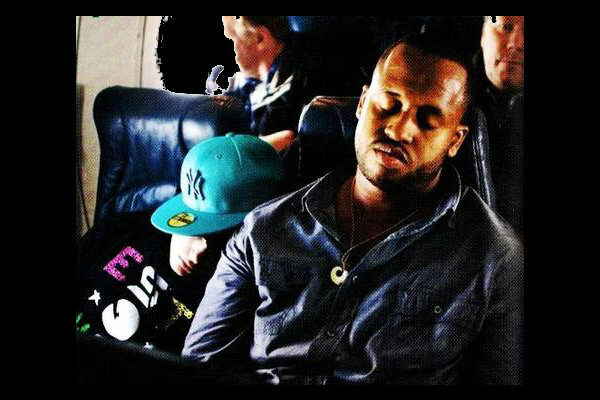 Justin is obviously not racist, as you can tell from his black friends and being so into urban culture. He said this stupid joke when he was 15 which was 5 years ago, and regrets it now because he isn’t that same naive kid he once was back then. People do stupid things when they are teenagers because they don’t know any better, it’s when you get older and learn about life then you look back and regret the things you said and did.. IF you never did anything stupid when you were a teenager and later regretted it, then count yourself lucky.. Because most people have. Boy! These ignorant haters and media outlets just will not let up on trying to destroy Justin, I tell you what it will never happen. The only way Justin, career will come to an end if Justin, decides to retire or quit the music business and I do not see that happeming anytime soon or never. Justin, as you get older just be careful of what you say because you know anytime you do or say something negative they are going to run with it and add lies to it. So, what do you want to happen? Let Bieber’s team pay a ton of money so that this video won’t surface? Yes, he may have lost a ton of fans because of this video but this will also give him a chance to genuinely say sorry for his careless mistake. This is probably the first time we heard a genuine sorry from Bieber. This may have caused a damage in his career but this also gave him a chance to man up and admit his mistakes and genuinely apologize. This unfortunate event gave him a chance to prove that he has matured to admit his mistakes and not make up excuses to cover it up. Funny how Bieber’s public apology was reported by TMZ. Media’s indeed trying to destroying Justin (sarcasm). Oh and FYI, there’s a difference between people who have different opinions on Bieber’s actions and attitude and people who hate on Bieber for no reason. The thing is though, most people won’t even take Justin being a racist seriously. For the reason that he is constantly surrounded by his black friends and is so into R&B and hip hop music and urban culture. Most people will see this as yet another stupid thing he has done. But just watch, his rapper friends will come to his defense as well as his black friends and mentors such as Usher and Will Smith. This will go away because there isn’t anything for his haters to hold on to, since they are the ones who constantly say he is trying to hard to be black! TMZ reported on it because they count on Justin getting them traffic. Birk, I don’t understand why you told me all that. I clearly know that Bieber isn’t racist (read my other comment jfc). I know that his black friends will defend him on people saying his racist because he isn’t. I know that because.. I.. have.. a.. BRAIN. So, what’s the point of you telling me all that? Well, that’s partly true about TMZ but what I said was that Bieber told his public apology to TMZ. TMZ could have not featured that public apology but they did. Showing that TMZ isn’t out to destroy Bieber. If anything, they helped Bieber clear this issue. Also, remember where the article showing Bieber’s drug report (and speeding report) after his falsely accused DUI was featured? Yep, it was on TMZ. They are the ones who cleared his DUI case proving that he wasn’t drunk. So, stop making it look like that Bieber is squeaky clean and that the articles featured on TMZ are lies. What are you guys to sue him for telling him bad jokes. Wow people. You guys need to get over it. Uh don’t you think other celebs tell jokes to about certain topics. Let’s not forget that just a few days ago, Louis Tomlinson said a racial slur and has not apologized. There was even a nationwide trend: #ApologizeLouisTomlinson, which was not directed for his pot usage, but for his RACIAL SLUR. Yet he has brushed off the incident and has ignored any opportunities to comment. Now, this happened when Justin was fifteen. I remember doing the same types of jokes when I was fifteen. Justin is clearly not racist, and he is even planning on making a PUBLIC VIDEO apology. He’s a man. Louis, on the other hand, is trying to avoid his apology in hopes of not bringing any more attention. Louis won’t apologize because he won’t change his ways.. Zayn probably is racist himself against black people as well. What is disturbing is the reference to cocaine(chicken) that Zayn and Louis kept bringing up, which is rumored to be the reason that Louis and Zayn have been thin for a while now and look rough. No one is saying anything because they probably know that Louis is racist and he won’t make a apology. Not all black is african just gotta put that out their. Justin is not racist. More than half his friends are African American. I’m glad Kenny stuck up for him. It’s offensive humor. TMZ should understand that concept considering it’s what their entire careers are based off of. Justin is not a racist.Im black and I’m not offended.its sad that while Justin is trying to better himself they have to leak a video from 3 to 4 years ago.ps is that Caitlin next to him? Yeah that’s her you should go on her instagram or twitter an she a rich girl now. Get over it. Justin is bad at jokes. First of all Justin thinks he is funny but wasn’t funny at all and it’s so not okay to call a black person the N word he should not be saying that now it looks bad thinking that he is racist. Must have been a slow day for TMZ. He’s clearly not racist considering he has many African American friends, employees, consultants etc. His charitable contributions are color blind. The fact they print this 4-5 years later is disturbing in itself. TMZ clearly has it out for him. I truly cannot stand them. That was like 4 years ago people. Get over it.